How to spruce up a kitchen? Let's count the ways: You can add brass details to warm up the typically cool and functional space. You can invest in beautiful cabinetry to bring in some bright colors and lend the room an emotional aspect. You can use rugs to add a global feel and patterns for visual interest. You can even throw in an amazing backsplash to turn a purely functional part of your kitchen into a masterpiece of decor. So what's missing? These are all great options for giving your existing kitchen a magnificent facelift, but they still don't address some of the most important pieces in your kitchen. Without the appliances, your kitchen just isn't a kitchen at all. And because they're so functional, we tend to think around them when working to style those spaces. 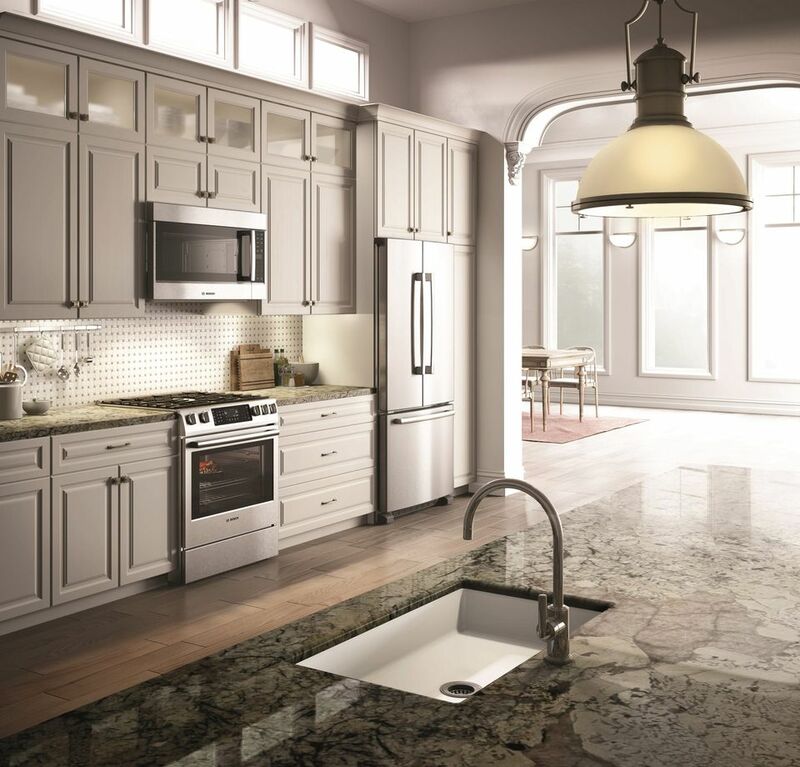 But some of the best kitchen companies in the world have been working to merge form and function -- creating appliances that will not only excel at their stated purpose but will enhance your decor while doing it. Some have even enlisted the help of designers to ensure that your next refrigerator or range hood will be your favorite piece of decor in the kitchen. Just as warm metallics like copper or bronze are a great contrast for spaces with white walls, cool metallics can be a refreshing moment in a room dominated by warm colors or wood tones. In this kitchen, the wall oven and French-door refrigerator -- both from the 125-year-old German manufacturer, Bosch -- break up the colors in the space without spoiling the mood. And the sleek lines, particularly on the over/under refrigerator/freezer combo, bring a palpably modern sensibility to a kitchen that might feel very rustic without them. One of the best things about innovation is that it not only brings more stylish options to the kitchen but some pretty cool conveniences as well. Here, modern technology allows a traditional-looking kitchen with room for little else (including a sink), to pack in an impressive number of cooking surfaces. On the island, the nearly flat Bosch Induction Cooktop offers 30-36" of cooking area along with a sleek space-age look. In addition to being a space saver, it's digital touch controls can set each of its cooking zones to any of 17 different heat levels while a timing feature ensures that they turn off at the moment the cooking is done. Sitting directly across from the cooktop is the perhaps even more impressive speed microwave, which purports to combine the features of a traditional oven and a microwave oven to allow baking, broiling and even convection-style cooking at much faster speeds. Some heavyweight cooking abilities from two very compact appliances that can bring your decor and your meal preparation into the 21st century. It's true that appliances don't tend to come in a staggering array of colors. Stainless steel is pretty much the only requisite for a modern look, and it's not a shade that offers a lot of variation. That doesn't present much of a problem, however, when you tailor your decor to include the color of your appliances in the palette of your space. Case in point: This Slide-In Range completes the color story of this kitchen beautifully, accompanied by the futuristic (and also color-coordinated) range hood. Hiding powerful blowers, dishwasher-safe filters and accumulated grease alike behind its stylish stainless steel facade, this is one range hood that promises to never spoil your decor with the unsightly side of cooking. Breaking the rule that kitchen appliances tend toward to the monochromatic, the Northern California-based kitchen hood specialty company, Zephyr, presents the Okeanito -- a chic kitchen solution in sophisticated black mirror, eye-catching rose gold or the ever-popular stainless steel. The culmination of a ten-year partnership with fellow Bay Area staple, designer Fu-Tung Cheng, the visually appealing overhead fixture offers everything from internal LED lights with a 25,000-hour lifespan to silent running modes and a wireless remote. Still, the most outstanding innovation and the one that the company seems most proud of is the sheer beauty of the piece and its ability to inject a new sense of style into what has traditionally been one of the kitchen's most functional and least appealing fixtures. Finally, for those who are perhaps not quite as ready to jump out of the stainless steel comfort zone in kitchen appliances, but still want something with a bit more color, Zephyr offers the Verona Island Hood. Designed specifically to overhang cooking ranges embedded in kitchen islands, this ultra-modern and beautifully styled appliance features the same silent-running technology that powers the Okeanito. And while it won't bring the same level of color to your kitchen decor, the Verona offers the intriguing option to select the color of the LED light display that encircles the glass canopy. Potential choices include Cloud White, Amber or Deep Blue. And if you really want to indulge in high-tech decorating, turn on the sample feature, which cycles through each of the colors in ten-second intervals. So pick one color or pick them all and start your next kitchen remodel with the press of a button.